There is a legend told in the Himalayan foothills village of Dahakhani of how a father sent out his son to buy some cigarettes at the village shop one morning in 1941. The son returned five years later, blind in one eye, minus his right hand and wearing the Victoria Cross, but without the cigarettes. Lachhiman Gurung had met a friend in the village who told him he intended to enlist in the Gurkha Rifles and that recruits were urgently needed. The Japanese had attacked Pearl Harbor and landed on the Malay peninsula only a few days earlier. Standing at only 4ft and an inch, Lachhiman would not have been accepted as a Gurkha rifleman, as the minimum height requirement was to be at least five feet tall. But the pressing need for brave, tough and loyal soldiers made his case an exception. Like most soldiers from the hills of Nepal, Lachhiman found himself fighting in Burma. The campaign had swung back and forth but by the spring of 1945, although far from beaten, the Japanese commander, General Seizo Sakurai was attempting to extract the remnants of the 28th Japanese Army across the Irrawaddy so as to escape eastwards into pro Japanese Thailand. At the beginning of May Lieutenant-General Sir Montagu Stopford’s 33rd Corps reached Prome in central Burma, on the east bank of the river. His orders from the commander of 14th Army, General Sir William Slim, was to keep Sakurai bottled up west of the river while the 4th Corps under Sir Frank Messervy fought its way south to relieve Rangoon. The 4th Battalion, 8th Gurkha Rifles was serving with the 7th Indian Division of Stopford’s Corps. The battalion faced repeated, fanatical Japanese attempts to break out over the Irrawaddy and across Messervy’s lines of communication. One company, commanded by Major Peter Myers, became cut off at Taungdaw west of the river in the direct path of successive waves of enemy attacks. 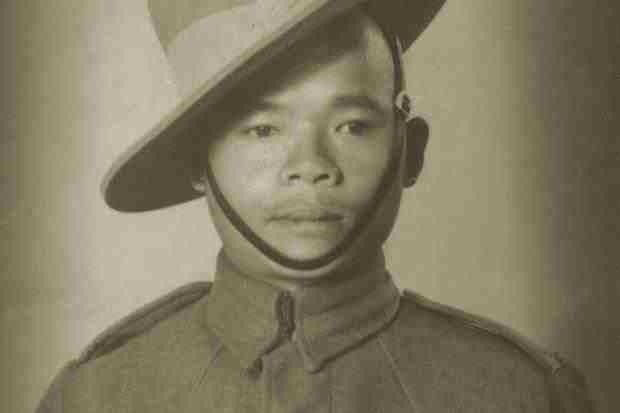 Rifleman Lachhiman Gurung had joined Myers’s company just two months previously as part of a reinforcement draft. On the night of May 12-13 Lachhiman Gurung’s section was manning the forward edge of Myers’s company position. At 0120 hours on 13 May a force of 200 Japanese launched a night attack. 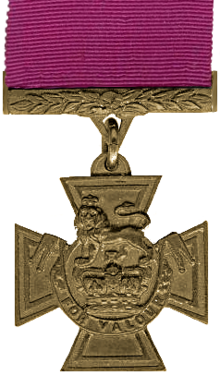 The brunt was borne by Lachhiman’s section and his post in particular, as it covered a track leading into the centre of his platoon position. The attack began with a hail of grenades, one of which fell onto the lip of Lachhiman’s trench. He seized it and threw it back at the enemy. Almost at once another landed in the trench. Lachhiman snatched that up and threw it back. A third grenade fell in front of the trench but exploded as Lachhiman grasped it, blowing off his fingers, shattering his right arm and severely wounding him in the face, body and right leg. His two badly wounded comrades lay helpless in the bottom of the trench. The enemy, screaming and shouting, formed up shoulder to shoulder and attempted to rush the position by sheer weight of numbers. Regardless of his wounds, Lachhiman loaded and fired his rifle with his left hand, maintaining a continuous and steady rate of fire as he had been trained. For four hours Lachhiman Gurung remained alone at his post, waiting calmly for each attack which he met with rifle fire at point-blank range, determined not to give an inch of ground. Of the 87 enemy dead counted in front of the company position at dawn, 31 lay in front of Lachhiman’s section. Had the enemy managed to overrun this point in the company’s defense, they could have dominated and then turned the whole of the reverse slope position. Although cut off for three days and nights, Lachhiman’s company, inspired by his example, held and smashed each attack as it came. Lachhiman Gurung was invested with the Victoria Cross by Field Marshal Lord Wavell, the Viceroy of India, at the Red Fort in Delhi on December 19, 1945. His father, aged 74 and very frail, had been carried for 11 days from his village to see his son decorated. Lachhiman’s injuries were so severe that he was unable to return to active Service during the remainder of the war. Not only had he lost the lower part of his right arm and right eye, he lost his hearing in one ear. On the Partition of India in 1947, the 8th Gurkha Rifles joined the new Indian Army. His VC has a place of honor in the room of the Regimental Quarterguard of the 4/8th Gurkha Rifles of the Indian Army in India to inspire future generations of Gurkha riflemen. According to Army records Lachhiman Gurung was born in Dahakhani in 1917. He was twice married. His first wife died in the late 1950s. He is survived by his second wife Manmaya, two sons and a daughter of his first marriage and two sons of his second. His eldest son Sibadatt became a Major in the Indian Artillery and his youngest son Krishnabahadur is serving in the Royal Nepalese Army. Havildar Lachhiman Gurung, VC, was born in 1917. He died on December 12, 2010, aged 93. A true hero and a true legend.